I envy everyone who attended San Diego Comic-Con 2015 this past weekend. Attendees were lucky enough to witness first looks at upcoming Star Wars, DC, and Marvel films. Fortunately, those of us who couldn’t attend have the internet and access to the streaming of panels, and releases of footage (official or leaked). Batman vs. Superman: Dawn of Justice finally gave us their first full trailer. Deadpool, X-Men: Apocalypse, and Suicide Squad headlined with panels and trailer presentations that made their way to the internet shortly after. Even THE MUPPETS made their presence felt, discussing their mockumentary series that will air on ABC later this year. The biggest takeaway from the SDCC weekend may have been exactly what all of us young (and old) padawans have been waiting for…Star Wars Episode VII: The Force Awakens coming to life. This past weekend, overall, was an excellent reminder of how good it is to be a geek these days. A generation that grew up on comic books, video games, and Superhero cartoons are now being treated to a Hollywood that appreciates those mediums. Before the first Iron Man movie, did you expect to see a full timeline of Avengers/Marvel films scheduled through May 3rd, 2019? Following Revenge of the Sith, Did you imagine Mark Hamill and Harrison Ford would team up again as Luke Skywalker and Han Solo? You’re lying if say you did…Or have a time-traveling DeLorean in your garage. Fox’s Gotham and ABC’s Agents of Shield series are fun, but not nearly as compelling as the stories presented in the Arrow/Flash universe (which I wish the DC film division took notice of). Meanwhile, Netflix has entered the ring with excellent original programming. The first season of Daredevil cleansed the pallet of a fans who were left with a bad taste after the previous adaptation, starring Ben Affleck. It also opened the door to a universe that will involve 4 other Marvel series on Netflix, including Jessica Jones later this year, then Luke Cage, The Iron Fist, and then The Defenders. Recently, I’ve noticed a contrarian and trendy narrative in TV shows, such as Community and Mr. Robot, that suggest people are suckers for enjoying Superhero films. In the writers’ opinion, we’re all lemmings for going to the movie theater and paying money for these films, and that’s just simply wrong. Just about every one of the Marvel films consist of better stories and dialogue than you’ll find in any of other franchises getting recent installments (looking at you Jurassic World, Terminator: Genisys and ALL of the Transformers films). I also think those are counter-culture comments being made for the sake of being counter-culture. Consider that a win, Geeks. You are today’s “culture”, and it’s wonderful. Yep. straight from Google. (Google is a jerk sometimes). Those who believe in the “unfashionable” and “carnival performer” assumptions are the same people who made fun of you to feel better about themselves and are probably looking forward to their high school reunions way more than the average person should. The truth lies somewhere in the sub-definitions. “A knowledgeable enthusiast” (obsessive is a bit strong) or one who “becomes extremely excited about a subject” sounds more like a typical fan than a “socially inept person”. It also applies to more than comic books, video games, and superheroes. If you are amped up for next seasons for The Walking Dead, Game of Thrones, or even less fantasy-driven shows like House of Cards or Empire, you are indeed a geek. If you are checking every new beer you try on the Untappd app, you are a geek. If you are over-preparing for your upcoming fantasy football draft or really looking forward to when Blackhawks tickets go on sale, you are a geek…not a freak. Geek is fun. Geek is chic. 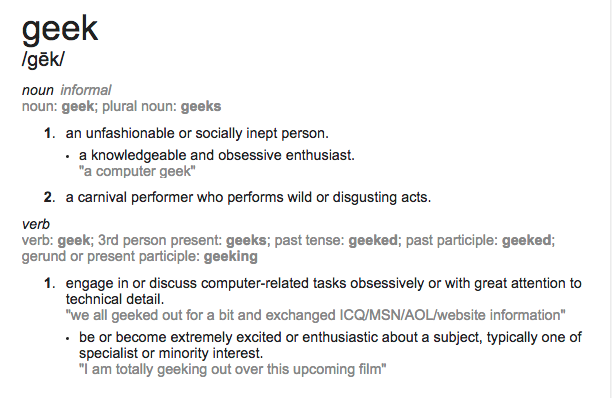 Geek is “normal”…I use the term “normal” very loosely because I don’t think there is such thing as normal. We all have different backgrounds, different interests, different hobbies, and different experiences. When we can bond on any of those different things, then maybe we start to feel “normal”. Being a geek is sort of like that. I love that I can discuss the things I get excited about on this website like movies, music, TV, sports and food, because I know there are many who share these same interests…many of whom, are in fact geeks (whether they identify as such or not). It’s a community that grows everyday thanks to social media and the ever-evolving entertainment culture, one that can be both appealing but sometimes over-critical. For now, it’s just simply good. I mean, who ISN’T geeking out about Star Wars returning this Winter? Of course as soon as I mention it in this post, Warner Bros releases the Suicide Squadtrailer. Enjoy! Have something to add? Continue the conversation on Twitter @Mike_PiFF03.